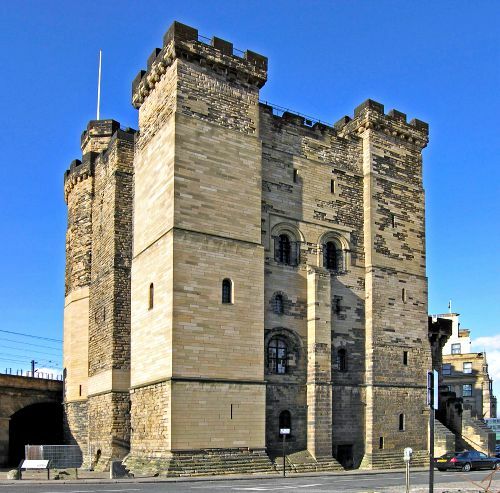 The keep of Newcastle Castle was built between 1172 and 1177 by Henry II. The site the castle was built on has been fortified since Roman times when Fort Pons Aelius guarded a bridge across the river. In 1080 a new fort in the motte and bailey design was built here by Robert Curthouse who was the eldest son of William the Conqueror. This new fort was simply known as the new castle upon the river Tyne, or just Newcastle upon Tyne which is how the city got its name. The infamous "Black Gate" was built by Henry III between 1247 and 1250, but the 75 feet gap between the 2 is now filled with a railway viaduct. Both the black gate and the keep are amongst the oldest in the city and even outdate the townhall which was built in 1265. The keep is now listed as a Grade 1 building as well as being an official scheduled ancient monument. Both buildings are open to the public as a tourist attraction and the keep has also been known to allow ghost tours and investigations. The keep has long been a favourite place amongst ghost hunters, since there are so many accounts of spooky experiences to come out of here. The most commonly reported occurrences are mostly in the form of subtle, yet strong clues. Including mysterious sightings of strange mists coming up through the floor and glowing lights shining in empty rooms, only to disappear when someone tries to enter. Apparitions are also amongst the stories of this place. Since the keep was used as a prison from the 16th to the 18th centuries this may explain why the apparitions are always described as wearing raged cloths and looking quite awful. As for the black gate it is claimed to have its own poltergeist presence. People who have visited here have made claims of being touched or pushed, and some people even claiming to have been scratched or pinched by the spirit. Who or what this thing is, if it even exists seems to forever remain a secret, but that doesn't seem to stop the stories from coming.